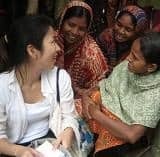 Shino Tsuchiya is a researcher based in London, working for Japan Research Institute Europe, Ltd. With experience of working for international NGO, she had been engaged in the private sectors’ business incubation and the public sectors’ policy making. She started BOP Innovation Lab (http://boplabjp.ning.com) in Japan as a networking platform on the base of open source concept. She is also a writer to the Japanese magazines, working for some projects with Japanese intrapreuners in the rural community, and researching for innovation process within its collaboration with communities. While I spent years and years researching BoP related business, there had been a lot of small changes in Japanese business and aid society, but last year, 2009, was totally different. 2009 was the year of a "Social Business" big boom, as domestic social business individual entrepreneurs are featured by media and also by governmental policy makers.